"I've been away too long. Runnin'...hidin'... Today's the day I stop running from my past." Though I should be desensitized to it by now, frustration still creeps in whenever I hear of a promising performer whose career is potentially put on ice because of a lapse in judgment. Latest charter member of the mugshot squad? 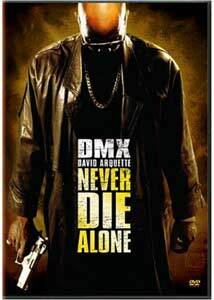 Rapper-turned-movie-star DMX. You guys hear about this? The "federal agent" story he told NYPD cops after they discovered a bag of cocaine and a billyclub in his SUV? Pardon me while I say, Stoooopid! Since I'm basically an old time rock and roll music if-you-wanna-dance-with-me type, I'll be the first to tell you I'm not a fan of the man's musical genre. Tom Petty once said something like, Rap is crap minus the 'c'. But I did dig the likes of Sugarhill Gang and Grandmaster Flash in my younger days when rap was a positive influence and the performers didn't present the aura of a future police report. But from the time I saw the performer formerly known as Earl Simmons on the cover of Rolling Stone a few years back, the effect I got back in return was mesmerizing. I mean, this guy just looked BAD. James Brown BAD. Shaft/Elliott Ness/Bruce Lee/Steve McQueen/vintage James Cagney BAAADD. That same instant, dangerous-but-can't-look-away charisma is superbly displayed in Never Die Alone, a nervy, knife-edgy crime drama that just may weadle its way into my still-baking 2004 top ten list. Effectively blending the influence of classic film noir with modern-day gangster settings, it weaves the tale of King David (DMX), a relentless, no-shame drug dealer whose past is beginning to eat at his insides. Wanting to return to his old neighborhood and start fresh, his redemption halts after making some sweet talk to a pretty young thing that sets up a confrontation instigated by her overprotective big brother. King sure picked the wrong type of sibling to agitate: a street thug assigned to collect a long overdue debt from David, whose mean temperament resurfaces in the midst. David's seriously wounded and lying in a puddle of blood with only good Samaritan Paul Pawlowski (David Arquette) to take him to the nearest emergency room. Too far gone, King expires on the operating table. But for Pawloski, an author, his relationship with David continues in spirit. Among the worldly possessions left behind as David's instant sole beneficiary? A boxed set of cassettes containing an aural autobiography covering David's last decade, which proves far more valuable to the success-craving author than the stacks of drug greenbacks. As K.D. 's voice fills the interior of his swanky Stutz automobile with supposedly new owner Paul behind the wheel (yet another perk), recollections of a velvet-smooth operator with charm to spare, the courage of a gladiator and an ultimate disposition of a leech comes forth: a ghetto Rumplestiltskin in reverse who tears the soul of any innocent woman he chooses to spin in two. Ask Edna (Keesha Sharp), a once beautiful woman whom he turned into a hopeless heroin addict. No wait, you can't. She's dead. Maybe you can track down Janet (Jennifer Sky), a blonde Hollywood starlet who fell for David's charms only to feel the pang of his fangs. Or perhaps Juanita (Reagan Gomez-Preston), a sleek, breathtakingly beautiful student working her way through college by playing waitress at a local L.A. based bar the King patronizes. However, she may wind up being an anomaly in his little black book of destruction; Juanita charms him in a way that's as sexily simmering as that Rose Royce oldie I Wanna Get Next To You spinning on the jukebox. Back in the present, Pawlowski can't get enough of this addictive story that has him cramming fresh volumes into his car and apartment stereos faster than a Stephen King fan turning pages of his latest novel. However, a drama is developing behind his back. Concerned that K.D. 's last known contact will off and blab details to the authorities, crime boss Moon (Clifton Powell) orders his henchmen to locate, then do away with him. Poor Paul. Honest to God, how hard could it be to find a white guy in a pimpmobile? Directed with stylish precision by former Spike Lee cinematographer Ernest Dickerson, Never Die Alone combines the appeal of classic exploitation (or in this case, blaxploitation) films of the '70s with an updated coat of sparkling gloss that's instantly irresistible. Though scripter James Gibson litters his teleplay (based on Donald Goines' classic novel) with a touch too many wince-inducing 'M' and 'N' words for some tastes (including mine), the characters are so well shaped and executed by perfect casting that such misgivings are rendered moot as this breakneck-paced movie keeps getting more and more intense (at a very tight 88 minutes, too). Though DMX's commanding, swaggering portrayal of a man who doesn't find (and perhaps deep inside, doesn't want to seek) his way out of his predicaments occupies center stage for much of the proceedings, it doesn't overshadow other great performances from surfacing, especially from Preston, Ealy, Luenell Campbell (memorable as the barkeep who welcomes King back to the 'hood), Powell, Sky, latter day Friends mainstay Aisha Tyler (in a darkly funny exchange with character boyfriend Paul) and terrific character actor Tom "Tiny" Lister. But the movie's wild card performer is definitely the vastly underrated David Arquette. Though he's done his share of filler, this highly versatile actor has quietly been building an impressive resume of terrific, varied performances in projects ranging from fun B movies (Eight Legged Freaks), family films (two recent Muppet movies), romantic comedies (Never Been Kissed) and A-list productions (the criminally under viewed The Grey Zone., and he was also Dewey in the Scream flicks; he was a gem in those, too). Alone may be his best performance to date in a role that echoes its enthralled audience—he's our conscience, the feeler of nearly identical emotions created by a situation so urgent, leading to the (hopefully) temporary loss of common sense to such a point, that he doesn't realize the mortal danger he's in. With DMX out of the picture so early on in a way, it takes more than a merly capable performer to feed such a vital part and Arquette does so brilliantly; at times, it's almost his film in the second act. Image Transfer Review: An active film on a visual scale with cinematography that can go from grainy, cinema verité fashion to slick MTV-esqe flair, this must have been a bitc...I mean, a job (hi, Mom) for DVCC to master. Although far from top-of-the-line (blacks and shadow detail are wanting among other minor deficiencies), it's still fairly impressive considering the circumstances. With, deep, rich colors and consistent sharpness amongst its virtues, I've no doubt that it will please surpass the expectations of those who caught its theatrical run and pass the grade with newcomers. Note: For those crybabies who just can't give up full-screen access, a pan-and-scan on the disc's flip side is included to quiet their whining. Audio Transfer Review: This is where Alone really shines in the technical department. From George Duke's versatile score to Felipe Borrero's sound mix (slightly laid back for action sequences, but c'mon, this is not Independence Day) to the vintage R&B classics spreaded about (how cool is it having Rose Royce in 5.1? ), it is excellent. Low bass, perfectly balanced dialogue, beautiful spread to the incidental scoring—all but the most critical audiophile will dig. Extras Review: Well, the good news had to end somewhere; unfortunately, it's here. There's an audio commentary, and though Dickerson, Gibson, and DMX are a notch above competent, whatever gel they establish is marred by the sometimes distracted rapster who winds up taking calls on his cell phone and departing midway through (doing some of your part-time gigging while you're supposed to be on the Hollywood clock, Agent Simmons?). Although some useful tidbits arise occasionally, the commentary tone is disappointingly observational and way too laid back. The degree of effectiveness given to the rest of the inclusions relating to the film sink like a stone with the perfunctory5-minute "making-of" and 11 deleted scenes (with optional commentary) that unintentionally serves as an excellent primer in how to cut filler (and folks, that's all they are). Trailers for four action-flavored titles in Fox's DVD library and an Inside Look at the studio's big fall multiplex offering (Taxi with Jimmy Fallon and Queen Latifah) complete the package. Never Say Die knocked me out. Despite so-so extras, the stellar sound and near-perfect visuals are good enough to compliment one of 2004's best films.